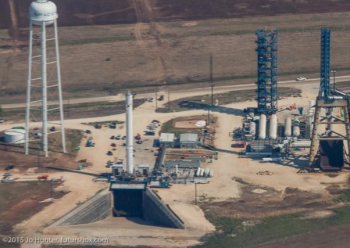 SpaceX has conducted the key milestone of a Static Fire test at its Space Launch Complex – 40 (SLC-40) pad on Friday. The debut launch of the upgraded “Full Thrust” Falcon 9 is set to loft eleven ORBCOMM-2 (OG2) satellites, marking the rocket’s Return To Flight. The launch date is now scheduled as December 20, pending a successful Launch Readiness Review (LRR). The return to launch operations for SpaceX has been half a year in the making, following the loss of the Falcon 9 that was attempting to loft the CRS-7 Dragon to the International Space Station (ISS). A post-failure investigation resulted in modifications being made to the rocket, specifically relating to the struts associated with the Composite Overwrapped Pressure Vessels (COPV) – while additional improvements, via a ‘deep dive’ review – have also been implemented. The path to Return To Flight (RTF) involves the first “Full Thrust” Falcon 9, which was rolled out of the SpaceX factory in August, en route to the company’s test site near McGregor, Texas. That stage was erected on the new dual-purpose Test stand and came to life for the first time via a 15 second static fire test. As per the original plan, the stage was prepared for a second test, this time for the usual full duration firing that all Falcon 9 first stages enjoy prior to shipping to the launch site. This test is utilized to provide a vital health check of the nine engines and associated systems. That test was successfully conducted on an unspecified date, confirmed only by the transportation of the stage to Cape Canaveral in the second half of November. Sierra Nevada Corporation (SNC) then successfully completed the Pre-Ship Review in late October 2015 for the satellites set to ride uphill, prior to delivering the 11 OG2 spacecraft to the Cape. All OG2 spacecraft are based on SNC’s SN-100 satellite bus, which can be tailored to support a variety of applications, including communication, Earth observation, weather and space science. The SN-100 is designed for a five-year-minimum life and utilizes a modular payload deck that can be rapidly integrated and tested using highly automated scripts to test all functions. The satellites were then encased inside the Falcon 9 fairing and mated with the vehicle. 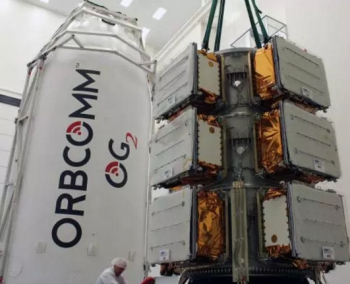 “We’ve got an exciting week ahead as we get ready for ORBCOMM’s upcoming OG2 Mission 2 launch,” noted the customer in a recent statement. 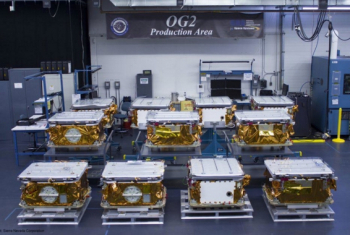 “All 11 OG2 satellites are fueled and stacked on the satellite dispenser, so they are ready to launch. SpaceX has integrated the two stages of the Falcon 9 rocket and encapsulated the fairing around the satellite stack. The encapsulated fairing is targeted to be mated to the Falcon 9 Tuesday, December 15. 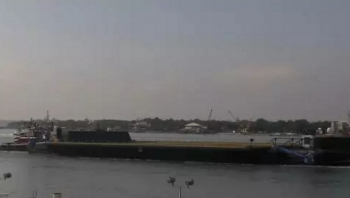 The Static Fire test is a major milestone ahead of a SpaceX launch. This test involves a full propellant loading sequence – this time marking the use of denser deep cryo LOX on the upgraded Falcon 9 – launch countdown operations, engine ignition operations and testing of the pad’s high-volume water deluge system. In effect, it provides a full dress rehearsal for the actual launch. The rocket was rolled out during Wednesday afternoon, prior to being erected on the pad at around 4pm local time (Eastern). 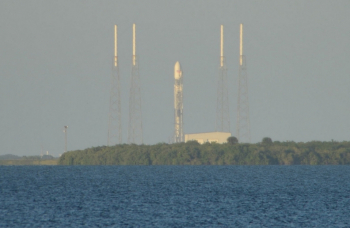 This marked the first time a Falcon 9 had been on the pad since the loss of the CRS-7 mission. However, the opening attempts to conduct a Static Fire on Wednesday were unsuccessful for technical reasons, moving the attempt to Thursday. During Thursday’s attempt – with the rocket remaining on the pad overnight – propellant loading followed the path of the launch flow, with the aim of a short ignition of the nine Merlin 1D engines while the vehicle is held down on the pad. However, several hours into the test window, with very little communication from official sources, Elon Musk took to Twitter to note they had been working through issues with the LOX loading. 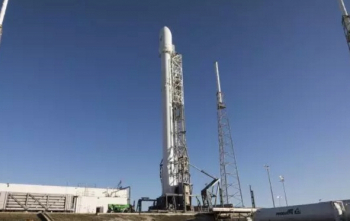 Hours passed without any further communication until the following day (Friday) when the customer, ORBCOMM, noted SpaceX would try to conduct the static fire for a third time during the day – albeit without any reference to the projected T-0 or window. However, the numerous attempts began earlier in the afternoon, without success until around 6pm Eastern when the Falcon 9 finally roared into life for a full duration firing. Should the test prove to be successful, and once the required engine and vehicle data is collected, detanking operations will follow, before the rocket will be lowered on to the Transporter Erector (TE) and rolled back to the hanger for final integration processing in anticipation of launch day. Providing the Static Fire proceeded as planned, engineers will take the flow into a Launch Readiness Review (LRR), which will then confirm the launch date for the OG-2 mission with eleven new satellites for the company. The initial launch date was to result in a launch window of 20:25-23:25 Eastern on the 19th. However, as expected with the static fire issues, this has since moved to an alternate date of December 20. That window was expected to be 20:02-23:02 Eastern. However, that has since been updated to an instantaneous window of 20:29 Eastern. The next launch opportunity will be December 21, after it was negotiated over the weekend, also with an instantaneous window at 20:33 Eastern. While the absolute priority of the mission is the successful deployment of the OG2 passengers, marking the Return To Flight of the Falcon 9 rocket, the core stage may make its most ambitious propulsive return attempt to date. All previous attempts to refine SpaceX’s ambition of returning core stages for eventual reuse have been conducted out in the Atlantic Ocean. Some of the most recent landing attempts have come close to nailing a touchdown on SpaceX’s Autonomous Spaceport Drone Ship (ASDS). One of the ships, “Of Course I Still Love You”, was spotted in transit on Wednesday, but SpaceX has not addressed the plan for her during the OG2 mission. All that is currently known for this mission is SpaceX’s ambition to conduct a historic landing on its new Cape Canaveral landing pad, officially known as LZ-1 (Landing Zone -1), but also tagged “X1”. Such an event would be at the mercy of refinements to SpaceX’s Federal Aviation Administration (FAA) launch license – which SpaceX hasn’t discussed publically. However, KSC workers have received a security notice on Friday, relating to large exclusion zones for one hour post-launch. “NASA Causeway, east of the Space Station Processing Facility to the Cape Canaveral Air Force Station boundary, will be closed until approximately 1 hour post launch,” noted the update in SpaceX L2. Mr. Musk later took to Twitter, his – and SpaceX’s – main route of limited information to the media and public to confirm the landing attempt on the pad. 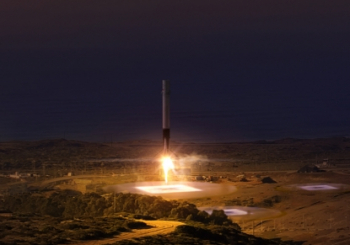 Previously it was understood that the first return to a landing pad would be via the Jason-3 mission, using the final Falcon 9 v1.1 rocket, launching out of SpaceX’s Vandenberg site – which is now scheduled to take place in the second half of January. In the event of a successful return of the OG2 first stage, NASA officials noted during a recent media event on the Space Coast that they would utilize the stage for testing at the company’s newly refurbished LC-39A, which will eventually launch both Falcon Heavy and Falcon 9 rockets.